BP is honored to be part of the support network for Team USA, now and through 2016. As part of our ongoing commitment to U.S. Olympic and Paralympic athletes, BP is excited to partner with MEDAL QUEST to present Adaptive Technologies, a collection of multimedia resources that explore the lives and challenges of U.S. Paralympians. Developed especially for educators, these resources are a powerful tool to engage students in learning about the challenges faced by athletes with physical disabilities and the adaptive technologies that allow them to compete at elite levels. Use these standards-based resources to increase students' understanding of people with disabilities, broaden awareness of Paralympic sports, highlight the adaptive technologies used by Paralympic athletes, and showcase the engineering design process used to create these technologies. 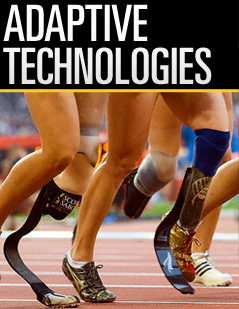 Visit the Adaptive Technologies Special Collection on Teachers' Domain. In this video segment adapted from DESIGN SQUAD, teams of high school kids use the engineering design process to build an automated wheelchair to help a U.S. Paralympic athlete train. In this video adapted from DESIGN SQUAD, teams of high school kids use the engineering design process to build specialized prostheses for a double-amputee dancer who performs underwater. This video resource, excerpted from DESIGN SQUAD, illustrates each step of the engineering design process. This printable image from DESIGN SQUAD illustrates the five steps of the engineering design process. In this MEDAL QUEST video, Paralympic archer Jeff Fabry shares the adaptive technology that enables his robot-like shooting routine and explains the impact archery has had on his life. In this MEDAL QUEST video, prosthetist Shane Ryley explains the care and technology needed to create high-performance artificial limbs for athletes. In this MEDAL QUEST video, Paralympians share how adaptive technologies have helped them perform in a range of competitive sports.